In our last episode, we intrepid converts were transitioning from Germany back to the states for Larry’s back surgery. Little did we know as we packed to leave that the next eighteen months would find us in four different states (geographical, not emotional). Getting back to the states was a real joy â€“ the Air Force, in its infinite stupidity â€“ required Larry to travel solo on a “medivac” flight even though he was still fully ambulatory. Miki and our two youngsters flew ahead to San Antonio and Larry followed a couple of days later. With the help of Morg in both Germany and Texas, we settled into a short-term rental and even had a car loaned to us while ours was being shipped. The support we received on both sides of the Atlantic during a couple of critical weeks was terrific and worth every dime of the club dues. We then began the arduous “hurry up and wait” of yet another round of medical evaluations before the specific surgery type was decided upon and scheduled, to include a health blessing for Larry (big surprise â€“ it really didn’t work) and the news that the anesthesiologist was LDS. Somehow, this latter item seemed more important at the time than it really was. The weeks that followed were a period of medical recovery with relatively little time spent in church jobs. Since it was common knowledge we were just passing through, we weren’t assigned any callings. We did, however, volunteer for one or two fund-raising inventories of local retail outlets. With all the support we had received, it was the least we could do. Getting to Phoenix five months after returning stateside was much more like a conventional work-related move. We quickly found our new ward, and settled into getting to know people and take on our assigned callings as part of what was supposed to be a three-year tour. Looking back thirty-plus years, neither of us can remember what any of our callings were. After our daughter reached her fourth birthday, there came our way questions about when the next little Pratt spirit would be making his or her appearance. As both our children were born Caesarean, a tubal ligation (required by the military doctors) was performed after Erica’s birth. While we had long preferred one or two more children, not having them wasn’t a major issue, particularly given Erica’s continuing medical issues. However, we felt that our church membership was providing us with the impetus to seek a tubal re-anastomosis in order to bring more spirits to earth. Just writing this brings about a gag reflex. Moving along, what was supposed to be three years at Luke turned out to be a very tumultuous nine months personally, professionally, and spiritually. Looking back at things through this essay, this may have been the most trying time in our marriage. Personally, our daughter endured a major crisis that would leave her mildly disabled and impact her for the next five years. At the same time, our attempts to get back into the reproduction game entailed an extensive amount of tests and evaluations. Any couple experiencing fertility issues needs to be told no more. Health blessings again fell far short of expectations for all concerned. Professionally, when the one-year anniversary of Larry’s surgery arrived, he was cleared to return to flying, by now becoming aware that the military was looking to fill a shortage of warm bodies in his specialty, risks be damned. He asked the flight surgeon who signed off on his physical, what would happen to him if, with a triple-vertebrae fusion, he had to eject from his aircraft. The response was something Larry has never forgotten. Larry managed to find a loophole in the system which essentially made him something of a pariah at the base who found himself with no room at the inn. After several weeks of personal contacts and phone calls to a few key people, he finally found a new specialty that would be an ideal match to include a post-training assignment that would actually be the zenith of our time in the church. The personal and professional demands on us resulted in our turning to the church more than ever. Ain’t that the way? It was during this time we bought our first wheat grinder and began food storage in earnest. We also managed a visit to the Mesa temple as part of a “group night” with our ward. We “double dated” with our bishop and his wife. As irony might have it, the day that this portion of our saga was to be submitted for review and approval, I happened across a spot-on bit of commentary in the “Pearls Before Swine” comic strip. Check it out â€“ the July 10 strip that proves a picture is worth a thousand words. This was also the time of the church being challenged by Sonia Johnson and we were initially disappointed in the treatment that Johnson received at the hands of the LDS hierarchy. Larry questioned our bishop regarding her excommunication for speaking her mind on the matter of the ERA. While his explanation isn’t fully remembered in detail, he made a case for the church supporting “traditional” roles for men and women within a family that was living under the umbrella of the church hierarchy. His unspoken but thinly veiled (there’s that veil thing again) message was that the church did not accept nor tolerate a loyal opposition and people did have the choice to leave the church if they were in strong disagreement with its policies. The message was clear â€“ those â€“ like Johnson â€“ who were in active opposition to current doctrine and policies, looking to achieve change from within, would be excommunicated for their rebellion. At that point in our time of demands and turmoil, our roots in the church were deepening and the bishop’s message had in it a sense of legitimacy. What were we thinking? Answer â€“ we, like most LDS members, weren’t thinking. We just went along with the system and were kept too busy to have any time to question, not to mention that, despite our perceiving increased shortcomings, the church was the best emotional support system we had. Nine months after arriving in Phoenix, it was off to the Denver area for four months of cross training for Larry’s next assignment. This short period was actually something of a respite from our most recent experiences. We weren’t in the local ward long enough to be assigned any callings (although we did work one inventory fundraiser), Larry’s transitional training went very well, Erica avoided any medical crisis, and Miki underwent a tubal re-anastomosis without incident. Spoiler alert â€“ her surgery yielded zero results which, looking back, was not an entirely bad thing. But that’s another story. August 1981 found us in Mountain Home, Idaho and the start of the two best years we were to spend in the LDS church. With the release of Larryâ€™s novel â€“ Dark Deception â€“ earlier this year, weâ€™ve fielded numerous questions about our experiences as adult converts to apostates. Thanks to chanson, we have a chance to bring some of the highlights of our seven years in the LDS church to Main Street Plaza. We hope you enjoy the posts weâ€™ll present in the coming months. The road to hell and out was indeed paved with good intentions. Tucson â€“ March 1985. Seven years and it’s over. Voluntary excommunication. Who would have ever thought our Mormon Road would dead end so abruptly? Our journey began in early 1978 while the family was stationed at Ramstein air base in what was then West Germany as part of an “accompanied” or family tour. We’d been in-country for about six months, still trying to get comfortable with “the system”. But being thousands of miles from home and family, with a chronically ill one-year-old, and living off base was making finding even the most basic social and emotional support system all but impossible. The world of jet fighters wasn’t conducive to family values. Watching people get drunk every Friday night just didn’t work for us. We were close to feeling overwhelmed. Finding a need for her own outlet, Miki volunteered with the X-ray department at the nearby Landstuhl army hospital. Here she met Bob and Fran L, a couple of married medical technicians and â€“ you guessed it â€“ active members in the Church of Jesus Christ of Latter Day Saints. As Mormons are wont to do, the couple began to fellowship Miki and socially engage the both of us in LDS social gatherings. Not unexpectedly, these gatherings suited our personal values to a “T” and the missionary lessons soon began. We werenâ€™t complete strangers to this process as we had both encountered some association with the LDS church in high school but never followed up. Both of us were non-smokers and light drinkers so engaging the Word of Wisdom was a non-issue and the LDS emphasis on family and social solidarity just about sealed the deal which was closed when we were informed that, after baptism, our daughter would be eligible for “health blessings” that would assist her in recovering from her ailments. What concerned parents, particularly a mother desperate to bring her child health denied since birth wouldn’t jump at such a chance? A lifelong car salesman couldn’t have crafted a better baited hook. Even with the high LDS club dues. Baptism took place in March 1978 and we quickly found ourselves caught up in a full range of church activities including jobs referred to as “callings”. With the first tithing check we felt entitled to a first health blessing for our daughter. It didn’t work and we were informed that things would get better with later blessings as our faith and testimony grew. Very quickly, the LDS church became the center of our lives that didn’t concern Larry’s work and the early years did prove to have more positives than negatives. point in the future, Miki would be told outright that the failure of the blessings was due to her shortcomings in faith. Can’t you just feel the love? An ironic footnote to our baptism is that, at nearly the same time, Miki’s brother’s wife joined the church in San Diego. Over the years she would have their four children baptized and wait dutifully and patiently until her husband was baptized over twenty-one years later. That must be the record for fellowshipping an LDS spouse until baptism. In November 1979 we were sealed in the Swiss temple. We had no idea what to expect and â€“as we found out later â€“ like many others, went through the motions of the bizarre ritual more out of social conformity than any spirituality. It didn’t help that, when it was time to be sealed to our children â€“ ages 3 and 4 at the time â€“ they came from child care smeared with chocolate pudding provided by the center workers. Good thing we weren’t expected to take pictures. The remainder of our time in the church would find our visits to the temple limited to single digits. We were to remain in Germany with our original ward for two years before a back injury took Larry out of his assignment and found us returning to the states for surgery, recuperation and being bounced around the western United States for a year and a half. Our initial time in the church was largely positive and certainly a vast improvement over what was offered elsewhere at the time. Perhaps most importantly, our membership and temple recommends would provide a cushion of camaraderie and social interaction against what was to be a very demanding period of time. Not to say our start in the church was without issues and reservations. As converts in an overseas ward largely populated by those born in the covenant with large LDS families and church roots that stretched back over a hundred years, there were subtle hints dropped here and there that converts weren’t considered “real” Mormons. Even within the “BICs” it was clear that some Mormons were more equal than others. It wouldn’t be until we were associated with the Ex Mormon Foundation that we would encounter the term “Mormon Royalty”. That said it all. Then there were comments about the lack of temple and prophet pictures in our home and how that could negatively influence our children. One couple remarked that our seascape painting would cause our son to want to go to sea rather than serve a mission. The painting never came down and no photos of temples or prophets went up. But, as long as we paid our tithing . . . Looking back, our exposure to the “you’re doing okay, but . . .” social mindset in the LDS community did indeed come our way early but we had bigger fish to fry during those first two years. Not that the next eighteen months would be any less demanding. As we prepared to make our first major life change since joining the church, we didn’t realize that the seeds of our leaving had been sown and, when the time was right, would flourish like wild flowers after a spring rain. A closing remark on the two years in our first ward â€“ the closest friends we had during this time were the inactive Catholic couple who lived downstairs in our base housing stairwell. It’s a friendship that, despite years and miles, thrives to this day. No one from our years in the LDS church had a word for us after March 1985. I’ve said some naively ignorant things in my time. But, then again, I’m nearing my mid twenties, so I’m sure I’ve still yet to see the rest of the iceberg. Nonetheless, regrets are worth analyzing for the lessons they teach to help avoid the same mistakes in the future, so that hopefully, when I look back, I find that, contrary to what I often tell myself, I haven’t said quite the number of naively ignorant things that I’ve thought. I jokingly said this nearly three years ago while I was in a particularly jovial mood after having been out with my best friend all day. Yet it was met by silence. Worse, it was met with a sort of bewildered insincere smile, which – as anyone who knows my best friend will tell you – is as close as he’ll come before he turns his back and walks way while shaking his head in disgust or coming back with some sarcastic one up-manship retort. While I hadn’t recognized that I had taken the wind out of his sail with my first bout of ignorance — there was no mistaking it now. Tears glistened in his eyes. His ship had been sunk. You see, I didn’t know what temple garments were at the time. In fact, I knew so little about Mormonism that whenever he used the acronym “LDS” it took me a second or two to recall what it stood for. While this may seem like some small, benign incident, it had a galvanizing impact on me. Little did I know – it was the beginning of the end; the beginning of a headlong dive into Mormonism, and the end of more than two decades of considering myself a Christian. naturally, Utah will always be associated with the church … today there are more Mormons outside the U.S. than in it. Today, Mormons are Bolivians, Ghanaians, Koreans and Russians, all an integral part of the church family. He gives us numbers to combat the “myth” that the Church is a white church. If there were 100 people in it, in 1980, 73 of them would have been from the US and Canada (presumably mostly all white), whereas in 2010, this number drops to 48. So, the Church is not only not white, but it’s also not American. It’s a multiracial, multinational Church. Of course there are a couple caveats that Otterson fails to mention. The second caveat is thatbecause Joseph Smith was a prophet and the first president of the Church (and all presidents after him have been prophets, as well), the faiths organizational structure reproduces itself in a top-down fashion. Converting people for the sake of diversity keeps things fresh and has the appeal of truthiness (white Mormons are ever-so-pleased to hear a person of color testify of Smith’s prophet status). But actually giving top-tier leadership roles to those with different cultural backgrounds is a recipe for discord, which the Lord wouldn’t want (who apparently only recently became a fan of interracial marriages). Let’s take a look at the General Authorities roster to see just how many non-American and/or non-white GAs there are (answer: few). Yes, as time goes on, this number may come to better reflect the actual membership, but let’s not forget how people of color can benefit from their possessive investment in vicarious whiteness (George Lipsitz as quoted in Smith, Darron, 2004, Black and Mormon, p159). There’s little sign of this whiteness abating. Consider the following account from Keith Hamilton, a black Mormon from North Carolina who has served as a bishop and was part of a 2003 Sunstone panel regarding the worldview differences between black LDS Americans and black LDS Africans and Caribbeans. Hamilton is intent to take race out of the equation when it comes to the movement of the truth of the Gospel in a global perspective. But his account only illustrates the multiple ways that race is written into the discourses of American nationalism, neoliberalism, colonialism (including, for example, the stereotype of the Asian as a “model minority”). So long as everyone has a forward outlook without looking back, everything will be okay, right? Or perhaps nothing will change. Sorry, Mormons, but this is nuts. Plus one for a baker’s dozen. 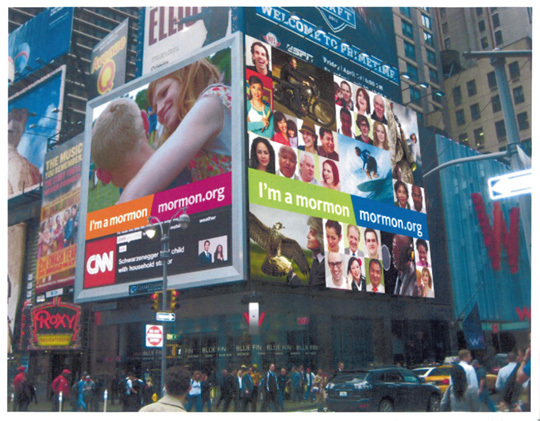 Local Mormons weigh in: Im a Mormon and I am here in New York and I really wish the church would pick some other place to advertise. But it’s not just Mormons. God’s Favorite Musical is driving evangelicals like John Mark Reynolds nuts, too. All signs point to Mormonism becoming the first American religious movement to go supernova. I personally think that my apprehensions were unfounded…I didn’t get that vibe from reading the article. Instead, I got a much different vibe. Sunday in Outer Blogness: Personal Entrance/Exit Stories! Calling all ex-mormons: the Great Mormon Novel? So, I’ve been reading a series of articles about the possibility of the Great Mormon Novel (the great fantasy of all Mormons since Chaim Potok came to the Jewish scene or since we all fell in love with that dairyman Tevye and his daughter)…some say that the Great Mormon Novel hasn’t happened because it is impossible. Others, perhaps very hopefully, disagree. (Also, A Motley Vision’s response and T&S’s summary). And since I know Chanson is very interested in ex-Mormon literature (she’s even gotten her own) and even has theories about Mormon literature , that got me thinking. the “Great Mormon Novel” would eventually be penned by someone who was born in the church, left the church, then made it “part way” back again. [Stegner] seemed to think that would be a perfect vantage point. Being away from the church would give the writer perspective, while coming part way back would guarantee his empathy for the culture.